Lake Garda isn’t just one of the most beautiful lakes in Italy, boasting picturesque towns, a rich history, and striking beauty; it’s also Italy’s largest lake. Spread across three regions (Lombardy in the west, Veneto in the east and Trentino-Alto Adige in the north), Lake Garda’s sheer size means figuring out where to stay, and how to get around, can be a little confusing! We’re here to help. Read on for our insider’s tips and tricks to Lake Garda, including which towns to visit, how to use public transport to get around Lake Garda, and where to stay! 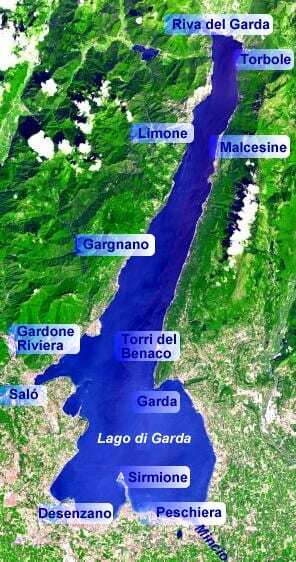 At about 30 miles long (50km) and 10 miles wide (17km), Lake Garda covers an area of 100 miles (158km). It’s dotted with more than 20 charming towns, from Riva del Garda in the north to Peschiera in the south. While some towns such as Sirmione are especially renowned, Lake Garda also offers many off-the-beaten path gems, such as Torri del Benaco (Veneto region) and Nago-Torbole (Trentino-Alto Adige region). Figuring out what to add to your itinerary? Here are a few of our favorite towns around Lake Garda. One of the lake’s smaller towns, picturesque, medieval Torri del Benaco has a lovely harbor filled with colorful fishing boats, the imposing Castello Scaligero, and a lakeside promenade lined with restaurants. Even in summer, this town remains relatively calm and makes for an idyllic place to relax. Nearby is the Monte Baldo park, known as the “Garden of Europe,” thanks to its variety of flora and fauna. 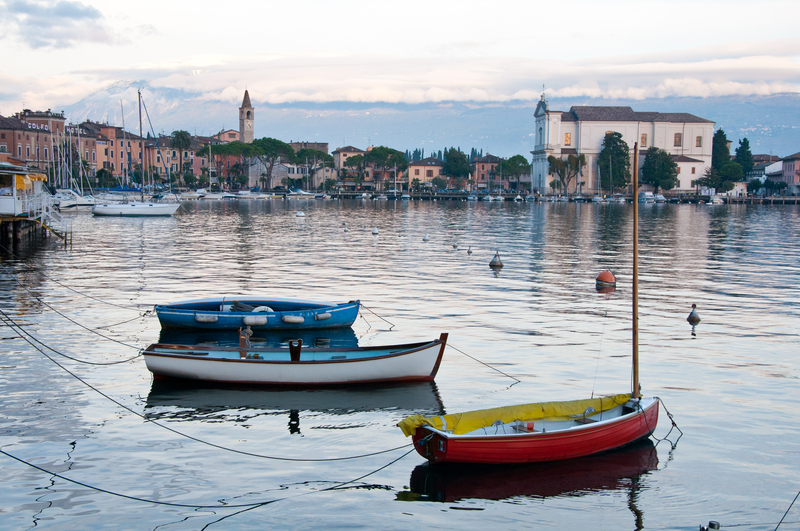 The mild climate makes Bardolino ideal for vineyards—so it’s no surprise that its hilly (and picturesque) landscape produces the famous Bardolino red wine. Wine aside, don’t miss the Romanesque church of San Severo, with its traces of original frescoes, and, nearby, the 9th-century church of San Zeno. A popular destination that’s retained its small-town charm, Limone sul Garda, lying at the foot of the steep Dosso di Roveri mountain, is known for its lemon groves (although its name isn’t derived from lemons, but rather the Latin word limes, which means “border”). A must-visit is the 18th-century Castel lemon house; acquired by the city in 1995, it houses a museum and an educational center. Also worth a visit: The San Pietro church, with beautiful 13th- and 14th-century frescoes. Salò, located on the foot of the San Bartolomeo mountain, is the largest city on the western part of the lake. And its lakeside promenade is the lake’s longest. Don’t miss the Palazzo of the Magnifica Patria, built in 1524 and rebuilt after the 1901 earthquake, and the Cathedral, which was commissioned in the 15th century. With Monte Baldo as its backdrop, Malcesine is stunning—and impressive. Most visitors come here for the striking Castello Scaligero and Palazzo dei Capitani, but many visitors also come to take the cable car to Monte Baldo for breathtaking, 360-degree views of Lake Garda. Famous (and touristy) Sirmione sits on a peninsula stretching into the lake. It’s also home to the Grotte di Catullo (the ruins of a vast Roman villa), the imposing Scaligero Castle, and its thermal baths. 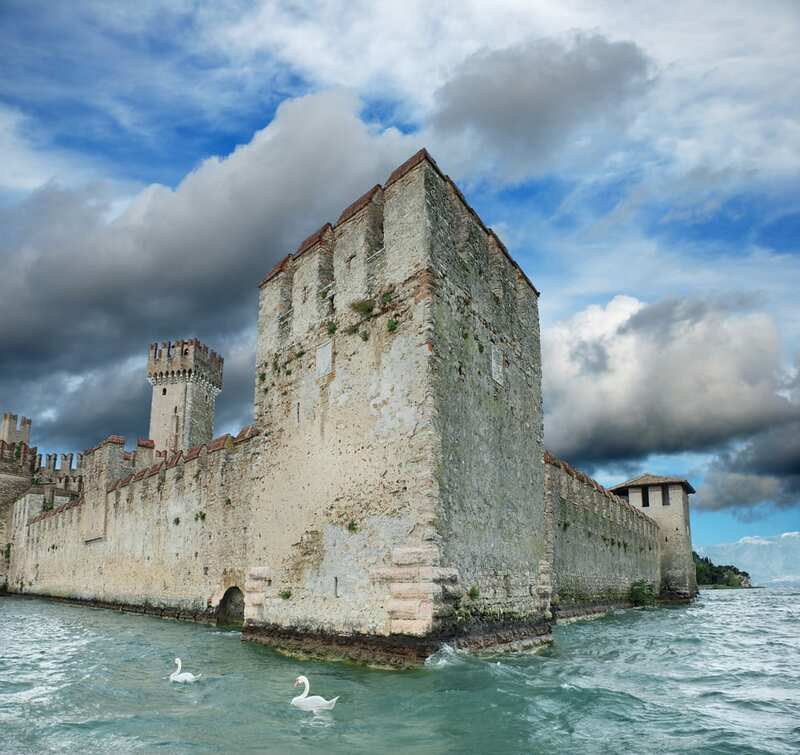 Keep in mind that in summer, Sirmione swarms with visitors; to best enjoy this charming town, try to visit in the off-season. Lake Garda is situated near several major airports, making it easily accessible. Verona-Villafranca airport, the closest, is only 9 miles (15km) away, while Brescia-Montichiari is 18 miles (30km). Another option is flying into Milan (both Linate and Malpensa airports), about 60 miles (100km) away. From the airports, you can take a car, train, or bus to Lake Garda’s towns (read on for more information about public transport at Lake Garda!). Two towns on Lake Garda can be reached by train from Verona: Peschiera del Garda and Desenzano. Both are on the southern part of the lake. It takes 15 minutes to get from Verona’s Porta Nuova station to Peschiera del Garda, or 20 minutes to Desenzano. Trains to both towns run almost hourly. 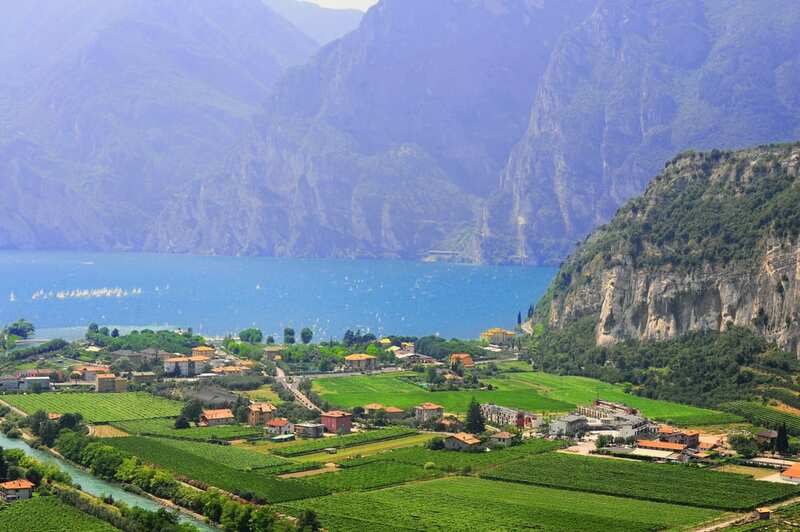 Traveling to Riva del Garda, on the northern part of the lake? From either Verona or Milan, take a train to Rovereto (about 40 minutes to an hour), then a bus to Riva del Garda. 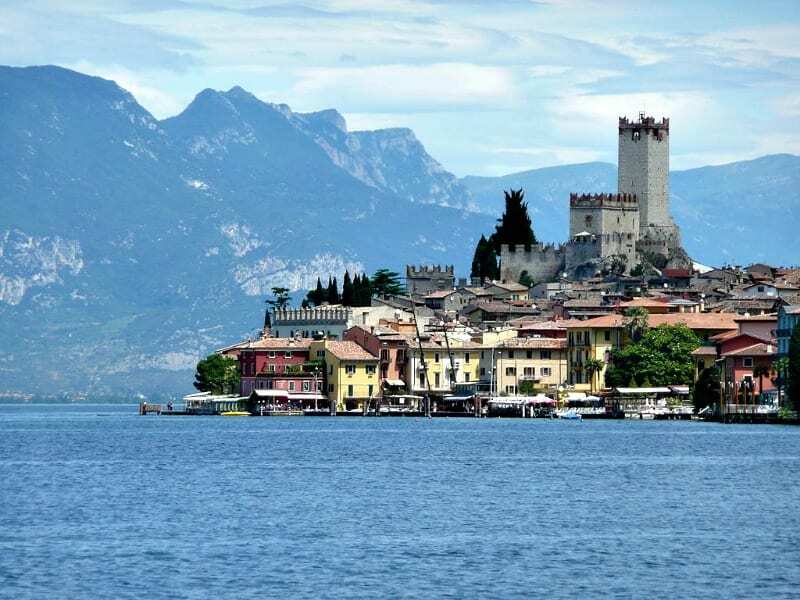 If you’re traveling to the eastern side of Lake Garda, you can take buses from Verona to Riva del Garda, including stops in Lasize, Bardolino, Garda, and Torre del Benaco, among other towns. The full bus schedule is here. 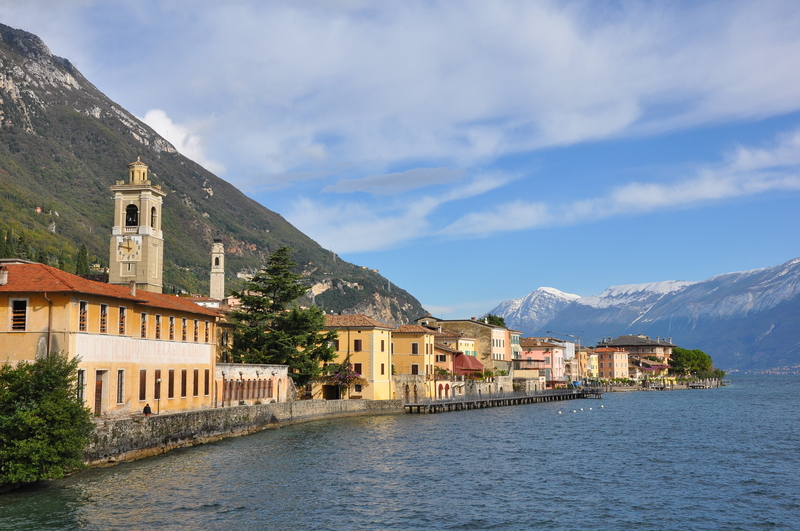 If you are going to the western side, your best bet is to take the train from Verona to Desenzano; from there, buses connect Desenzano with towns all the way to Riva del Garda, in the north. From Desenzano’s train station, you can also take the bus to Sirmione, which takes about 30 minutes. Note: Buses tend to be more frequent in the summer, which is the region’s high season. Another convenient mode of transport is the ferry. Lake Garda’s options range from standard to fast ferries; there are also ferry services for cars between Maderno and Torri del Benaco, and in summer, also between Limone and Malcesine. The timetables can be downloaded here for the various times of the year, and you can find the details for ferry prices here. While there are plenty of accommodation options around Lake Garda, we recommend staying in an agriturismo, where you can combine having an “authentic” experience of the area with enjoying the beautiful outdoors. (Here’s everything you need to know about staying in an agriturismo in Italy!). This website has a listing of farmhouses offering a wide range of facilities. Another popular option is camping. These are not your average campsites! Many boast excellent facilities, such as swimming pools, kids’ clubs and even an on-site restaurant. There are campsites all around the lake; at this website, you can search for them by town. Have you been to Lake Garda? What were your favorite towns and sights? Let us know in the comments! Well written, all the these town are caractheristic. Also Lazise in the east coast worth a visit. I agree if you visit Malcesine go to Monte Baldo the view is incredible. Really it’s most beautiful place. I like this. How do i get from Milan to Sirmione in lake garda? We have our visa appointment tomorrow and I didn’t realise we had to have all our accommodation booked! We arrive in Rome on Sat 31 and need to be in France by 6th June! We are having a meeting in Venice on the 3rd, but other than that we are flexible. We really would like to see Rome, Venice, Positano and Tuscany. We want traditional farm/low key rural accommodation if possible. We would most like to not have to stay in too many different places if possible, but to rather travel and come back to our accommodation at night. While we would like to see some of the standard must see tourist sites, we would really like to experience vineyards and the essence of Italy. We are on a tight budget, and have seen your recommendation of Monestery and farm stays. I hope you are able to help at such short notice! Ciao Christy, apologizes for the delayed response! We hope your visa appointment went smoothly. We would suggest booking various b&Bs and agriturismi (farm stays) in the various cities you’d like to visit. We think it may be difficult to do day trips to Venice, Positano and Tuscany from Rome, so you may want to consider choosing one or two destinations for your week-long vacation (like Rome and Venice) and doing day trips nearby. Do let us know if you have any questions! We plan to come to Italy for 6 or 8 weeks (Feb. and Mar. of ’15) and like to rent places for 2 weeks to get to know an area then move on. We travel primarily by train or ferry or bus and would like an idea of the weather at Lake Garda in Feb. and what would be a good base town to explore the area. Thanks so much! Ciao Jan, have you considered the beautiful town of Sirmione, located directly on Lake Garda? Hi Barbara, maybe this website will help you: http://www.tripadvisor.com/Travel-g1850051-c204924/Lake-Garda:Italy:Lake.Garda.From.Bergamo.Airport.html Have a great trip! You have shared really useful info in this article – ” Lake Garda, Italy: Where to Stay, How to Get Around, and More “. with necessary details. Tons of thanks to this Author. We are visiting Northern Italy in the early June. After reading your articles, I am looking for a place in farm through the site you mentioned (Agriturismo). But it is difficult to tell whether we are okay without a car. Do you know farms that we can get around easily without a car? I appreciate for your help! Garda town is beautiful, with numerous narrow side streets, hiding little gems of places to eat & drink. Fabulous lakeside promenade makes a great place to sit, chill and watch the world drift by. Where is the best place to stay for walking? Circular day and half day routes. We are experienced hikers so we don’t need to hug the lakeside. We won’t have a car so meed to be able to get straight onto paths from where we are staying. Are the paths well marked? Unfortunately that’s not our area of expertise, but perhaps this site on hiking in Lake Garda can help you. Have a good trip! we are going to be in Lake Garda for 7 days. How is the best way to visit the towns that are on the lake. We plan on staying in Peschiera while there. What is the best way to explore the towns on the lake. By bus or by ferry. And can we catch a train from Peschiera to any of those towns? Are there tour guilds that you recommend ? Thanks for your help and any suggestions you might have. 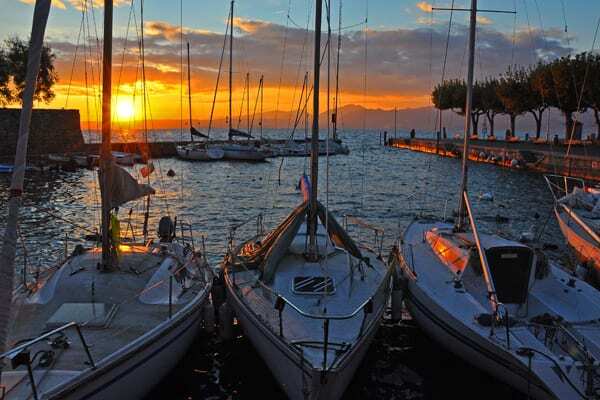 This article on Lake Garda might help you to plan your trip! Great site you have here! I am planning to visit Lago di Garda in late September, coming from Verona. I was considering either Melcesine or Riva del Garda to stay, any recommendations? Sorry, but we haven’t been to every town along the lake! That said, our main suggestion would be to stay where there is a ferry port (you can see them here), that way you can easily tour other spots on the lake during your time there!